Leveraging on our vast industrial experience we have been offering a wide assortment of Bimetal Bushings, which are fabricated in accordance to various industry standards. These have been widely acclaimed in the market due to their quality. Bi-metal Bushes : The most popular being Steel back with Copper Lead Alloy lining. This is specially used for high loads. 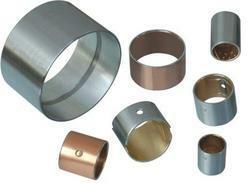 Bimetal bushes are used extensively in tractors and for heavy machinery for various applications. These are operated in harsh environments, yet they must perform their task without any compromise. We manufacture the bushes according to customer requirements and they are of superior quality to operate in severe environments. Bi-metal bushes used in laminated spring and shackles are subject to impacts, vibratory loads as well as friction. Our bi-metal spring bushes are tough and capable to withstand the loads. Furthermore, grooves and grease retaining dots are embossed to retain lubricating material and thereby reducing wear and providing longer life in rugged environments. Kingpin bushes require high accuracy manufacturing. We recognize the requirements of its applications and deliver precise products. Our bimetal kingpin bushes are manufactured as per customer specifications and are provided in machined as well as pre-machined sizes as required. We take extra care that these bushes serve the purpose well and provide longer life than normal. 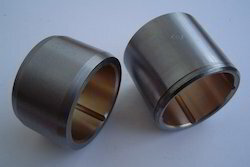 The spring bushings are manufactured from Bimetal strips. These are good for taking impact, vibratory load as well as friction. It has Copper-Lead Bronze lining. Laminated springs and shackles for heavy commercial vehicles.